Out of the Blues by Trudy Nan Boyce, a Mysterious Review. Review: Detective Sarah Alt — known as "Salt" to her colleagues — has just been promoted into the homicide division of the Atlanta Police Department. Her boss, Sergeant "don't call me Sarge" Huff has given her a small cubicle with a desk and chair. No computer, no partner. 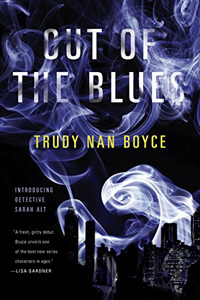 She has been assigned, however, a ten-year-old cold case, one which her role as a street cop comes into play, in Out of the Blues, the first mystery in this series by Trudy Nan Boyce. Mike Anderson, a blues musician, had died from an overdose of heroin. At the time, it was determined that his death was accidental. Now, however, Curtis Stone claims to have new evidence. Stone, a current prisoner courtesy of his assault on Salt years ago, says that Anderson was unknowingly given "hot pop", a pure form of heroin, which immediately killed him. Anderson's accidental death is now deemed a homicide. Salt's first act is to interview Stone, who could be given a lighter sentence if he is able to give credible evidence that can be used to arrest and convict the murderer of Anderson. In addition, the information from Stone could very well overlap with a current investigation by Salt's steady beau, Detective Bernard Wills, who also works homicide. She interviews Anderson's parents, his girlfriend, and his band mate, who leads her to Pretty Pearl White. Their information seems to link Anderson's death to the Reverend Midas Prince's Big Calling Church. How far can Salt go it alone before she must reach out to the men in homicide or the FBI or whoever can back her up? Will Huff assign her a partner, or does she have to prove herself first? Out of the Blues sets itself apart with an incredibly diverse cast of characters on both sides of the law. And at home, Salt has Wonder, her over-protective dog to keep her company. There are many historical facts about Atlanta that are presented, many having to do with Salt's case, but some purely entertaining, such as the rich history of songs from the past to the present. A well-structured police procedural at its core, but the dynamic relationships between the characters make it seem more robust. Readers will want to know more about Salt based on this solid start to a series. Special thanks to guest reviewer Betty of The Betz Review for contributing her review of Out of the Blues. Acknowledgment: Penguin Group provided a copy of Out of the Blues for this review.